A Murray River township 135km north-east of Adelaide, and 275 kms from the Murray Mouth. In those days Blanchetown was an important riverbank terminal where goods were offloaded from paddlesteamers to be cleared through the local Customs House. The town's prosperity suffered when the railway by-passed it in favour of upstream Morgan. Blanchetown was one of the first river settlements in South Australia. Surveyed in 1855, the town was named by Governor Sir Richard Graves McDonnell after his wife Lady Blanche McDonnell. It began life as a stopover point and watering place for mail contractors and coaches carrying passengers on the "Sydney Road" as it was then known. Proudly standing are several buildings from the town's first development including the original Post Office, Hotel, School and Police Station. Development of the district goes back as far as 1841 when the explorer, Edward John Eyre was appointed as Protector of Aborigines and established the first Murray River European settlement in South Australia just 6 kms south of the present site of Blanchetown. This area was called 'Moorundie', the name of the local Aboriginal Tribe. This area was subject to flooding so another site was chosen and the present town was developed. Eyre stated in 1839 that this area had a salubrious climate and indeed is still very agreeable. Today it presents a fascinating mix of historic buildings and a motley cluster of riverside weekenders fashioned largely from corrugated iron, fibro and driftwood. Over the years, shacktown has gathered a certain celebrity and the owners have formed their own association to look after their properties and interests. The first of a series of seven locks on the Murray in South Australia (William Randell Lock in honour of the pioneer of river navigation in the 1800's) was completed in 1922. There is a hotel, a swimming area, a caravan park, camping sites and a Store. There are garages on the western bank of the river and the turn-of is opposite the Service Station on the highway. A bridge has been built in recent years. The old bridge in the town gives an excellent view of Lock 1 and circling above are hundreds of hungry pelicans that love to feed on the schools of fish near the spillway. Although Blanchetown's towering cliffs are famous for the grand views of their changing colours, closer inspection reveals fossilised treasures such as starfish, shells and fish. Nearby is the Brookfield Conservation Park 11km out of town, a dedicated habitat and breeding ground for the southern hairy-nosed wombats that can be seen grazing on the western side of the river. 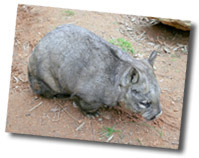 You can also see wombats on the Morgan road at dusk coming up from their burrows. The Park is managed by Conservation Volunteers Australia for the South Australian State Government. Blanchetown's history is full of quirky stories such as this: the Post Office building was originally intended to be a railway station, but the rail plans changed and no track was ever built. Discover more about its history by undertaking the Blanchetown Historical Walk. Pick up a copy of the booklet from various outlets in the town. Probably the most interesting building in the area is the Blanchetown Hotel which has been trading on its present site for 117 years. The Hotel license is actually older than this because the license was transferred to the current site from a position further downstream. The building itself is a gem of pioneer construction. The rafters were shaped with a broad axe. The 6 x 8 inch nails used were hand made. The roof rests on rough shaped sapling bearers which still, incidentally, retain their original bark. Mind you, the bar area has been modernised to a degree but, fortunately, the licensee, who has an eye for preserving the original building, has not in any way changed any other section. All this is certainly a building which must be visited by anyone who enjoys historical architecture. There are many other items of interest for the tourist, just ask the Hotel staff. Completed in 1922, Blanchetown lock was the first on the Murray River system. The purpose of the lock and weir was originally built to provide year-round river navigation for commercial cargo boats and for irrigation diversions by pumping or gravity. Today the commercial cargo trade has disappeared, but the weir and lock continue to serve the original irrigation function and are increasingly important for recreational boating. Learn more about locks and weirs. Burk Salter Wines is a recently opened boutique cellar door. Call in for tastings and stay the night at the adjacent bed and breakfast. Blanchetown has some fantastic houseboat cruising sections on the Murray River. Contact Griffen's Marina to organise your next houseboating experience.